250900Z POSITION NEAR 29.4N 134.0E. �Typhoon Francisco has brought nearly three times the normal amount of rainfall for the month of October to portions of Shikoku today resulting in the evacuation over over 500 households and the continues threat of flooding and landslides. Thus far the storm has produced winds up to 146kph have been seen on Daito Jima while on the Main island of Okinawa 97kph wind gust were recorded. At the Kadena AB where a good bulk of our readers are winds up to 40kts or 75kph has been seen with sustained winds lingering just under Tropical Storm Strength. The threat though through Friday and Saturday will be the drenching amount of rainfall Francisco will produce across Japan. Already several landslides have been reported on the Kii Pennisula and in Yoron Kyushu 5,500 people from 2,500 households had to be evacuated. In Kochi Shikoku where over 500mm on rainfall has occured in the past 24hrs over 500 homes have been evacuated due to rising waters. These rains have been due to a Stationary front north of Francisco that has set up with the support of a upper level trough to the north and moisture being sucked in from the typhoon to the south. With Francisco passing off the coastline on Friday it will add to the heavy rainfall that has already occurred bringing an additional 300mm across the region. By the time Francisco reaches Tokyo it will be well off shore, yet heavy rainfall is still possible through Friday and Saturday morning. The good news is that the rains should quickly taper off through Saturday evening leaving rapidly improving conditions behind it. Tokyo is not expected to see damaging winds but there could be a few reports near the water front over 50kph during the overnight hours.� Wide Spread rainfall will be around 100mm across the Kanto area through Saturday afternoon. The worst of the weather in the Kanto area will be near coastal areas and including Izu Oshima. Izu Oshima is the island where rescue workers continue to search for bodies following last weeks devastating Typhoon which caused a massive landslide is especially prone to the storm. The areas that were destroyed by last weeks landslide are now lacking vegation to hold the soil in place as heavy rains start to batter the island in to Saturday morning. This means there is a risk of yet more mudslides. Nursing facilities and clinics on the island are set to be closed as a precaution ahead of the storm. Oshima Town officials have evacuated about 550 elderly and disabled people from the island. The rest of the 2,300 residents that reside on the island have been advised to evacuate in fear of more landslides. Residents of Izu Oshima are being advised to evacuate the island today in fear of more landslides following Wipha. Town officials on the island of Izu Oshima, south of Tokyo, have advised more than 2,000 residents in 2 mudslide-ravaged areas to evacuate their homes. The call on Friday comes as another storm approaches the island. On October 16th, Typhoon Wipha delivered heavy rain to Izu Oshima, triggering mudslides. 31 people were killed and 13 are still missing. Town officials fear more downpours due to the approach of severe tropical storm, Francisco, which may loosen the ground further and heighten the risk of more mudslides. About 2,300 residents in 1,200 households live in the risk areas. Town officials say they may issue an evacuation advisory for the rest of the island’s areas, depending on the rainfall. The operator of the crippled Fukushima Daiichi nuclear plant is racing to secure storage space for tainted rainwater as another powerful typhoon approaches. Tokyo Electric Power Company has begun moving the rainwater into underground pools once deemed too leaky. The water is the result of typhoons and downpours that have filled barriers around radioactive waste water tanks. TEPCO has been storing the most contaminated rainwater in tanks and in the basement of a turbine building. 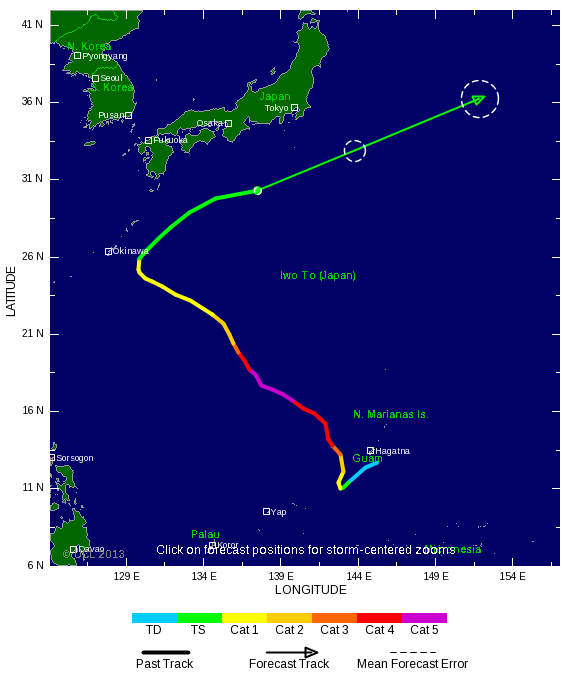 But with Typhoon Francisco set to hit Japan�s mainland over the weekend, the tanks are full. Japan�s nuclear regulator has approved moving the tainted water to 3 underground pools. The pools have a total capacity of about 9,000 tons. TEPCO stopped using the pools after similar models leaked in April. The utility now says it has no other option but to use them. The utility also says it found 140,000 becquerels per liter of Beta-ray emitting radioactivity in an onsite ditch on Wednesday. The radioactivity has doubled since the previous day. TEPCO says it is transferring the contaminated water to a tank. AT 28.6N 132.5E SEA SOUTH OF JAPAN MOVING NORTHEAST 15 KNOTS. MAX WINDS 60 KNOTS NEAR CENTER. 975 HPA, MAX WINDS 60 KNOTS NEAR CENTER. 990 HPA, MAX WINDS 45 KNOTS NEAR CENTER. 1000 HPA, MAX WINDS 35 KNOTS. AT 45N 179W SEA SOUTH OF ALEUTIANS MOVING EAST 10 KNOTS. AT 45N 137E SEA OF JAPAN MOVING NORTHEAST 15 KNOTS. 121E 37N 126E 34N 126E 34N 130E 30N 130E. WATERS BOUNDED BY 51N 162E 60N 170E 60N 180E 52N 180E 51N 162E. HIGH 1032 HPA AT 43N 114E SE 10 KT. HIGH 1026 HPA AT 55N 148E EAST 10 KT. HIGH 1026 HPA AT 46N 154E ESE 10 KT. HIGH 1016 HPA AT 21N 170E WEST SLOWLY. STATIONARY FRONT FROM 30N 131E TO 32N 134E 33N 137E 32N 142E. This entry was posted in NEWS, Search & Rescue News, Severe Weather and tagged DaitÄąĹ¤, Francisco, Hurricane, Izu Oshima, Japan, Kyushu, Maritime, Okinawa, Severe Weather, Shikoku, Shipping, Tropical Storm, Typhoon, Typhoon Francisco. Bookmark the permalink.